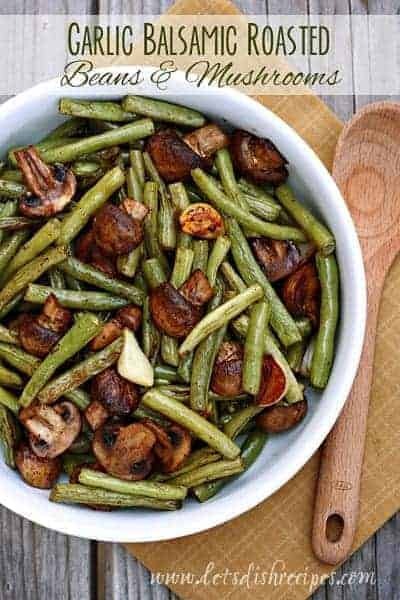 BALSAMIC GARLIC ROASTED GREEN BEANS AND MUSHROOMS — Balsamic vinegar and whole cloves of garlic make these roasted green beans and mushrooms extra special. It’s always a challenge to find simple yet delicious ways to serve vegetables to my family, but these Balsamic Garlic Roasted Green Beans and Mushrooms definitely fit the bill. 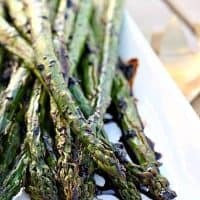 They’re easy, delicious, and healthy. What more could you ask for? 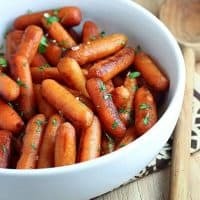 I feel like it’s important to serve vegetables with dinner, but I often resort to tossing a bag of baby carrots on the table with a bottle of Ranch dressing. Not that there’s anything wrong with that, especially since that’s one veggie I know my kids will eat! But every once in a while I like to serve something a little more fancy, if you know what I mean? And balsamic vinegar makes just about anything seem fancy! These delicious roasted beans and mushrooms have just a few simple ingredients, and once they’re in the oven, I don’t need to fuss over them. 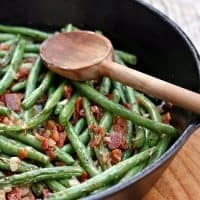 My husband and I especially love green beans prepared this way, and my kids will eat them too (although a few of them bypass the mushrooms), which makes this the perfect side dish for almost any meal. I made these as a side dish for our Thanksgiving feast yesterday. Delicious! It came out wonderful! 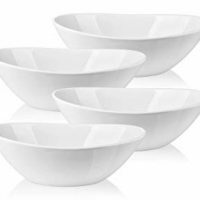 I love that this dish is simple enough for every day dining, but classy enough for company and special occasions. This is the kind of recipe that I know I’ll be making for years to come! 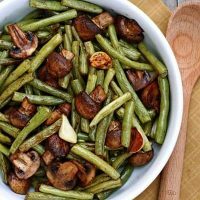 Be sure to save this recipe for Balsamic Garlic Roasted Green Beans and Mushrooms to your favorite Pinterest board for later. 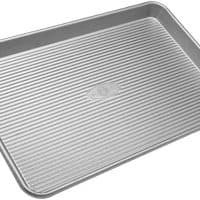 Spread green beans, mushrooms and garlic in an even layer on the prepared baking sheet. In a small bowl, whisk together olive oil and balsamic vinegar. Drizzle over vegetables in pan and toss to coat evenly. Season with salt and pepper, to taste. Bake for 20-25 minutes, or until beans are tender-crisp. Who Dished It Up First: Adapted from Kalyn’s Kitchen. Roasted vegetables are so simple, yet decadent at the same time. This looks like a fantastic dish! This looks so wonderful. 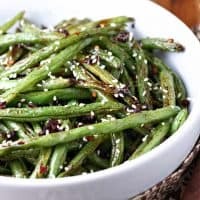 I love green beans but never thought of making them with balsamic vinegar. How do I toss to coat evenly if they’re laying on the pan and already been drizzled? 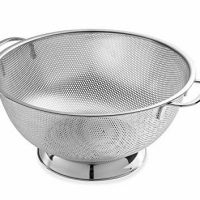 I just use my hands to stir them around, but you could use a spoon if you wanted. I had the same question. Why not toss the beans in the mixture before putting them on the pan? Seems they would be completely coated if tossed in a bowl. I just didn’t want to dirty an extra dish. But you could certainly toss them in a bowl. Or mix the balsamic mixture up in a large bowl, add the beans, and toss them that way. I just made them for a church supper tomorrow. Hope they reheat well! I added a pinch of oregano and basil, and a Tbs. of raw honey to the mixture. Delicious! Thank you for this recipe. I’m sure I’ll make it many times. They were good but I was expecting more flavor. I’ll try marinating them a little more before hand. Why try to put someone on blast with asking how to coat them if on a sheet, just get the jest of it. If you can’t figure out how to coat them, maybe you shouldn’t be cooking PERIOD….Not sure why I get caught up with reading comments. Some women are complete beasts. Maybe asking questions is a good way to learn. 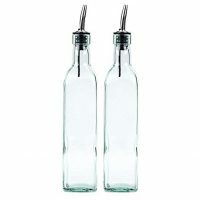 These were absolutely fabulous. I’m tickled by some of the responses about how to toss them. This was very good. It was a bit bland so I added a dash of balsamic vinager. It was so good. We couldn’t get enough of it. Thanks for another great way to get vegetables. I just made this dish tonight. im not a good cook and not confident in the kitchen but I’m trying. My dish didn’t turn out. The green beans are almost burned and super dry. :(. I did 450 degrees for 20 mins like the recipe said. Help!! The beans will have a few “burned” looking spots being roasted. But it sound like maybe your oven runs a little hot and you’d just need to cut back on the cooking time, maybe 15-17 minutes instead of 20? I hadn’t this same problem my first time, so I’m sure my over runs hot. My second time around I turned the heat down to 375 and only cooked them for 15 min. The beans were prefect. Lower the heat of your oven. Temp. vary depending on the oven, don’t give up keep trying. These were so yummy. Thank you for the recipe. I made these as a side dish for our Thanksgiving feast yesterday. Delicious! I omitted the garlic, because I had garlic in several other dishes. And I used 2 bags of frozen green beans instead of fresh, because the store had sold out of the fresh. But it didn’t matter. It came out wonderful! I also added some orange zest grated on top at the end, with the salt and pepper, and it really added a delicious and unique taste. So wonderful! I’ll be making it again, for sure. Thanks for sharing this recipe! Thank you! The orange zest sounds wonderful! Vanessa, did you follow the oven temp and roasting time per the recipe for your frozen beans? 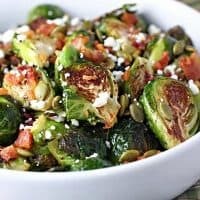 I’m looking for something “interesting” to do with my frozen beans for Thanksgiving. Thanks for your help! I look forward to making this for our Christmas dinner. Thank you so much for sharing! As for some of these comments/complaints…..I am seriously dumbfounded. Why should anyone have to give you specific instructions on how to coat/toss vegetables on a pan, and why can’t people open the oven to check the cooking progress to ensure they don’t burn? Roasting vegetables isn’t rocket science and this recipe is as simple and straightforward as it gets. Hi! I tried the recipe and it was absolutely delicious! I don’t think I’ve ever had this delicious green beans before. I made these and are delicious. Everyone loved them. I added almonds to them. I have also put them in a slow cooker with onion powder and almonds another time. Both were delicious. Enjoy. Thanks. I roasted red peppers w olive oil & minced garlic and a bit of ginger on a sheet with hole garlic cloves & cremin mushrooms. I steamed green beans in my instapot when finished I coated them w olive oil and balsamic reduction sauce. Plated the beans and sliced the peppers and placed them over the top with the mushrooms. U could use butter, bread crumbs & grated Parmesan. But keeping it lentil for Easter. Hope this works for U? I don’t normally take the time to review but this dish deserves it. Easy and delicious! Will serve to company next weekend. Sure to impress!